Good news from the Fed -- Ben Bernanke is going to set an inflation target (2%, of course I wanted higher, but given the state of expectations this is a move in the right direction). And he's going to buy more bonds. Bank people are saying things like "My expectation is that we are going to get quantitative easing three in April." 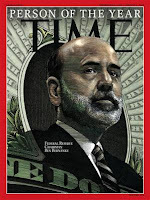 My expectation is that Ben Bernanke and Mario Draghi are going to keep the recovery going into an Obama second term. I don't know how good this is long term, though -- as a supporter of higher inflation, I'd rather Paul Volcker had set a 5% inflation target back in the bad old double-digit days, and people's expectations had stuck with that. Now we're going up to a low target rather than down to a high one.